Sheffield United kept their slim League One play-off hopes alive by beating Shrewsbury Town, who are just two points above the relegation zone. Blades goalkeeper George Long saved Kyle Vassell's first-half spot kick. 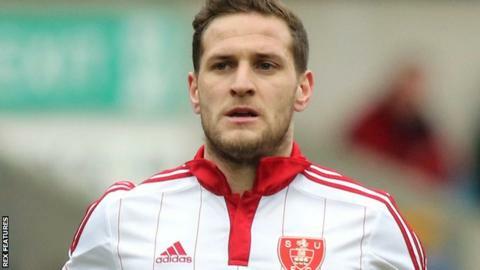 Billy Sharp then put the visitors ahead with a low shot, his 20th goal of the season, only for Abu Ogogo to level from Sullay Kaikai's cross. But Che Adams won it for United, who are four points outside the top six, firing in low from the edge of the box. Shrewsbury are now without a win in seven games, during which they have picked up just four points out of a possible 21. "If I'm absolutely honest, which I always try to be, I thought the only team that was going to score was us because we looked like we had the momentum. "But then a bit of slack defending from a throw-in and we got punished. It was hugely frustrating. "I couldn't fault much of the performance. We deserved much more than we got, but a bit of loose defending on two occasions cost us." Match ends, Shrewsbury Town 1, Sheffield United 2. Second Half ends, Shrewsbury Town 1, Sheffield United 2. Substitution, Sheffield United. Martyn Woolford replaces Che Adams. Attempt missed. Sullay Kaikai (Shrewsbury Town) left footed shot from outside the box is close, but misses to the right. Attempt blocked. Sullay Kaikai (Shrewsbury Town) right footed shot from outside the box is blocked. Substitution, Sheffield United. Florent Cuvelier replaces Ryan Flynn. Corner, Shrewsbury Town. Conceded by Alex Baptiste. Attempt blocked. Shaun Whalley (Shrewsbury Town) left footed shot from outside the box is blocked. Attempt missed. Jean-Louis Akpa-Akpro (Shrewsbury Town) header from the centre of the box is close, but misses to the left. Abu Ogogo (Shrewsbury Town) wins a free kick on the right wing. Substitution, Shrewsbury Town. Shaun Whalley replaces Jack Hendry. Attempt missed. Chris Basham (Sheffield United) header from a difficult angle on the right is close, but misses the top right corner. Attempt missed. Andy Mangan (Shrewsbury Town) header from the right side of the box is just a bit too high. Attempt missed. Jean-Louis Akpa-Akpro (Shrewsbury Town) left footed shot from the left side of the box is just a bit too high. Goal! Shrewsbury Town 1, Sheffield United 2. Che Adams (Sheffield United) right footed shot from the right side of the box to the bottom left corner. Assisted by Paul Coutts. Billy Sharp (Sheffield United) wins a free kick on the right wing. Foul by Jack Hendry (Shrewsbury Town). Substitution, Shrewsbury Town. Andy Mangan replaces Kyle Vassell. George Long (Sheffield United) wins a free kick in the attacking half. Corner, Shrewsbury Town. Conceded by Jay McEveley. Attempt missed. Jean-Louis Akpa-Akpro (Shrewsbury Town) header from the centre of the box is too high. Corner, Shrewsbury Town. Conceded by David Edgar.